We are going to reuse the same rules engine as available in the accelerator. 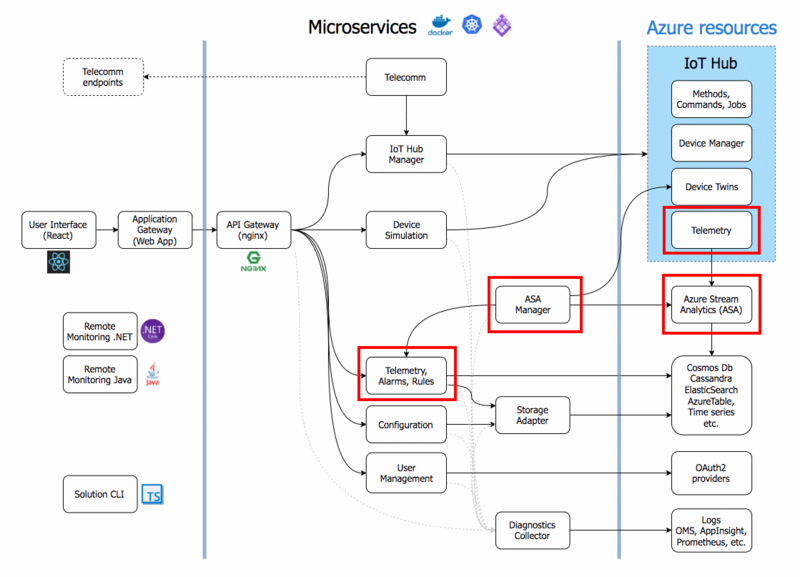 You will see we only need to add and configure some Azure resources in our own resource group. We will ignore the UI regarding maintaining this rules engine configuration. To start with the easy part, just generate your own Remote Monitoring accelerator. 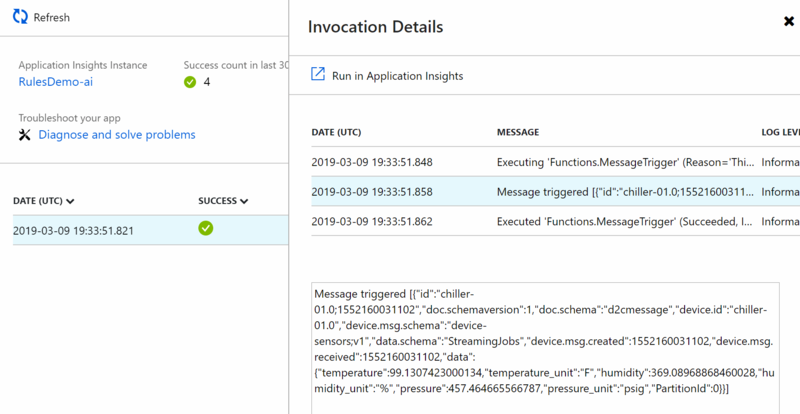 Yes, this accelerator will burn some of your Azure credits if you keep it running for days but we only need it for a short period, just to see how it behaves. We focus on the Stream Analytics job inside it. And we can see how it’s working because the accelerator spins up some device simulations on startup. Yes, this format is pretty simple so you probably will need to rewrite some part of the rules engine to make it support your own message format. But this is relatively simple compared to the work done. The structure is simple, each device registered in the IoTHub is also put in this file and connected to a group ID. "__rulefilterjs": "return (record.__aggregates.pressure &gt; 298) ? true : false;"
"__rulefilterjs": "return (record.__aggregates.temperature &gt; 98) ? true : false;"
Here we see two different rules. 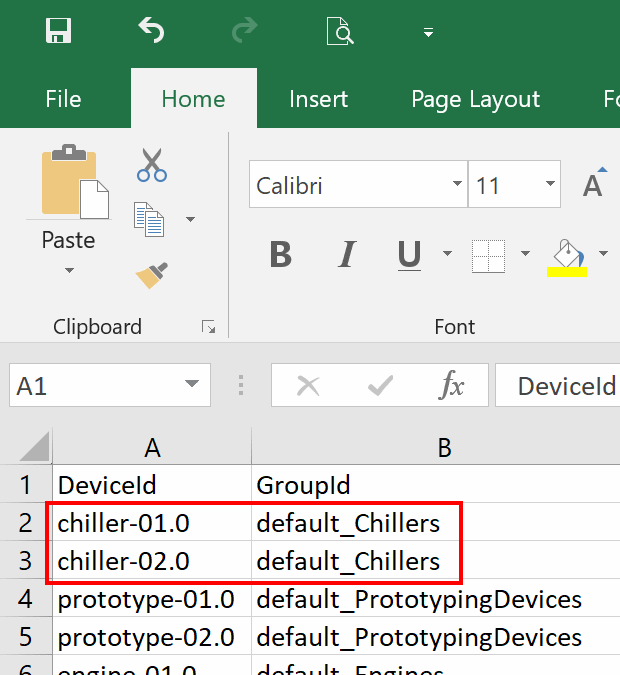 Both are connected to the same GroupId, “default_Chillers” (as seen in the CSV file with device groups). Check out the second rule. It contains an extra property named “Actions”. It’s an array with two actions here. "__rulefilterjs": "return (record.__aggregates.vibration.avg &lt; 0.1) ? true : false;"
Here a rule is defined to raise an alarm if the average vibration of a device in the “default_Elevators” group is below 0.1 for the last ten minutes. It’s easy to add more of these predefined intervals in the original query. This concludes the input into the query. Before we check out the query, let’s look at the output. 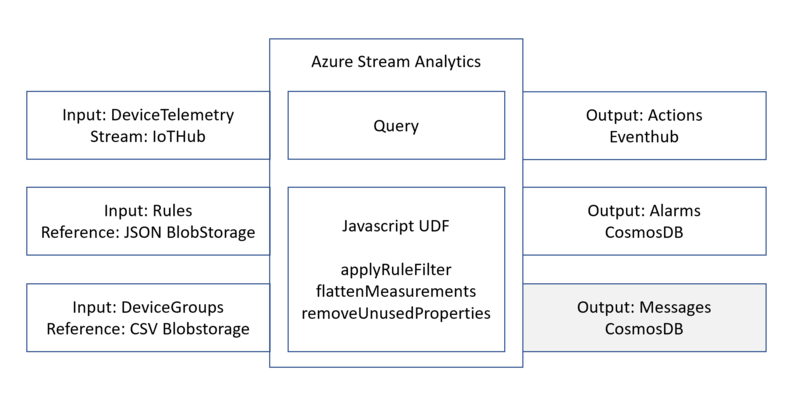 Originally, Microsoft has defined three different outputs, one to an EventHub and two to the same location in CosmosDB. Strangely, the Message output to CosmosDB never made it into the query. So it’s safe to ignore this unneeded output. This leaves us two different outputs. For convenience, I used two Azure Functions while testing the rules engine. Later on, we will see what is arriving into these outputs. For now, check out the ‘Record’ variable which represents the original message or the aggregation. After I deployed my own accelerator, I notice the script only supports alarms and tasks! the Messages output was not used. I checked this with the original code in GitHub. This second script supports the messages output. And that’s the only difference. Just copy one of the two scripts into your own Stream Analytics job. In this example, I created three Azure Functions. These are triggered by an HTTP call. And these can be used for ASA outputs. So just start the job and send the same message as seen at the start of this blog. Note: For some unknown reason the timestamp is written as a ‘tick’. This rules engine is quite powerful and a great start for your own projects. You can add and update rules on the fly. If you have a more complex format of incoming or outgoing messages, expect some serious rework and testing to get it supported by your updated rules engine. But still, you now know what to expect from a solution like this. And perhaps this is a good motivation to adopt the complete Remote Monitoring accelerator.